The night before I had my egg freezing surgery, I had a few friends over. My sister called it The Egg-cellent Adventure Party, which was appropriate as the whole process was certainly an adventure! I hope you learn something from my story, that it helps you ask more questions of your own doctors, and/or it helps you make a decision about whether you want to make the same decision I did. When I was in my late 20’s, my doctor started asking me when I was going to freeze my eggs. Back then, I thought he was crazy. I wasn’t even 30! Fast forward to my 30’s and I was in a relationship that was going nowhere. In my gut, I knew we shouldn’t, and ultimately wouldn’t, be together so I started to think more seriously about freezing my eggs. I will say that I’ve never been someone who needed to have kids. If I did, great; if not, it just meant I would have more time available to help other people (kids included) in my life and profession. Basically, in my mind, there was no losing scenario. That said, I wanted to have the option, so in 2014, I decided to go for it. And I’m so glad I did because even though I don’t know if my eggs are viable or what the future holds, I don’t spend any time regretting my decision or wishing I had frozen them years ago. It has completely removed that potential worry from my mind, allowing me to focus on other things. 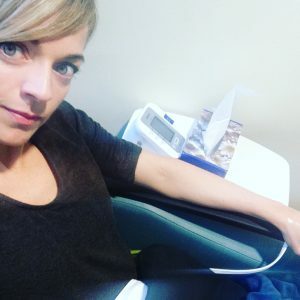 I’m also so grateful for what I learned during the process – about my body, pregnancy, medicine, the unbelievably advanced options that exist because of the fertility industry, the impact of stress and diet, success stories, sad stories, how common miscarriage and infertility is, and what an incredible miracle it is for a healthy baby to be born. My decision about who to involve was easy: my Naturopath and an Acupuncturist/TCM who specialized in fertility. Some might wonder where my medical doctor (MD) was in this, but I’m a Holistic Nutritionist who, over the past 20 years, has learned firsthand how the body can heal itself, so conventional medicine just didn’t have a role in this. That said, the fertility industry is a drug-based industry so it’s not like my body wasn’t being exposed to anything unnatural! In fact, the drug/hormone exposure (and the unknown short and long term effects) was actually the biggest roadblock for me to move forward with the freezing. Here I am, totally believing in the potential of natural everything, yet I was considering injecting my body for x days with hormones that would force me to ovulate and produce more eggs than normal. But in my gut, I knew I had to do it. As it turned out, it was the needles I underestimated #omg #ouch! I went to Olive Fertility Clinic in Vancouver. My doctor was Dr. Gary Nakhuda. As it turned out, I had friends who had used him as well and he was highly recommended. I was totally overwhelmed in the beginning because you have to learn to give yourself needles. Needles aren’t my favourite thing, nor is blood, but the worst part was the pressure of perfecting this injection process on my own, plus the fact that there is a lot riding on how well you can do it! I had a session with an awesome nurse – Carol Porter (with the same last name, I considered it a sign I was doing the right thing!). Carol taught me how to do the injections which included: prepping the ‘work area’, prepping the syringe, adding the Qcap, adding the correct amount of fluid (which has to be mixed with powder while in the syringe), adding the injection needle, making sure it’s on tightly, getting rid of air so the fluid is at the top (without losing any fluid), keeping the needle clean the whole time, preparing the ‘injection site’ just below the belly button, injecting the fluid into your stomach, then slowly releasing the fluid into your body. I sat in this session thinking ‘YOU HAVE GOT TO BE KIDDING ME?! I have to do this on my own?! What the ****?! In my head, step one was ‘find someone to do my injections’! I asked around about who could do injections and eventually because I used to do marketing for wellness brands, I was introduced to a sales rep for one of the drugs I would be injecting. I told him that I thought it was ridiculous that we had to give ourselves our own injections and said I would pay for someone to do it. It’s already a big investment to have your eggs frozen so a few more bucks to make sure it’s done right is not an issue. And I couldn’t imagine other women wouldn’t feel the same. This sales rep agreed and put me in touch with a nurse, who ended up coming over the first night to do the injection. Ironically by the end of the session, she had taught me how to do it on my own. In the morning, I was still a bit nervous so I headed to my friend Kerri’s place. She had done fertility treatments previously and was happy to be a support! I went to her place in the morning for my first injection and eventually, after much deliberation, heart pounding, analysis, sweating, rethinking, I mustered up the courage to jab the needle into my stomach and release the fluid inside. Oprah has her famous ‘aha’ moment. I had an ‘OMG WTF!’ moment! What was I doing? This was crazy?! But there was no turning back…the egg freezing process had begun. My surgery was at 1130am. I was given some drugs beforehand and by the time I went in, I was feeling good! I still need to confirm how long the surgery was, but basically I was wheeled in, met the nurses, somehow ended up talking to the doctor about why he should go to Las Vegas, and what felt like 5 minutes later, it was done. I got 6 mature eggs, which isn’t a ton, but it’s more than nothing and as they say in the industry, it only takes 1 to have a baby. I got home, slept for about 3 hours and by the end of the day, was feeling pretty good despite some bloated, pain in ovaries, a bit of back pain and not moving too quickly. November 24: The day after surgery, I felt good. They say you might have spotting or cramping but I hardly had any. I had to take Provera, which is a birth control pill, so that my period would start. I started to seriously consider doing this a second time around. This was such a good day. The surgery was done, the stress of it was over, and I was so grateful that I no longer had negative energy from my past relationship in my life. November 26: I was still pretty tired and my ovaries and pelvic area were just really sensitive but I managed to get into the gym for a quick workout without any issues. November 29: I was still super tired, bloated and had sore breasts, though I wasn’t sure if it was because of the surgery or the birth control pills. It didn’t last more than a few days. Overall, life was back to normal. So by my 40th birthday in December, I had frozen my eggs. Mission accomplished! I took the month off to decide if I was going to do another round but decided against it. There was just something that told me it wasn’t going to make a difference if I did. If my only goal was to be a mom, I definitely would have done it again but as I said, I’m okay with any outcome so I decided to end 2014 and my 39th year with that goal checked off the list! Freeze your eggs. You won’t regret it. Try to do it before 35 (as per the clinic’s advice). If you don’t like needles, find someone to do the injections for you. It will relieve so much stress. Don’t stress. Stress actually shuts down reproductive function so do all you can to be good to yourself. Keep in mind that stress is not just emotional or mental – poor diet, dehydration, lack of sleep, too much exercise…these are all stressors on the body. Cut out alcohol. As per most practitioners (ND’s, nutritionists, fertility experts, acupuncturists, etc) I spoke with, alcohol is the number one thing to avoid, which I did. That said, as someone who regularly educates about the stress and it’s impact on the body, I would say that if a glass of wine is going to chill you out, drink it! I would rather someone be relaxed and have the edge taken off than be stressed out about this process. Read the Tao of Fertility. Use meditation to keep you calm during the process. Don’t book anything intense during this time and try to keep your calendar as open and flexible as possible since you need to do injections at certain times. Use ice free your skin before injections. I only did this on the last injection but if you can’t handle pain, you should make use of the ice. Eat well. Well, of course I’m going to say this. Eat naturally, cut out anything fake (sugars, diet pops, etc), avoid hormones and pesticides, drink plenty of water. If you’re someone who absolutely must be a Mom, then I would probably say considering freezing your eggs as early as you can.